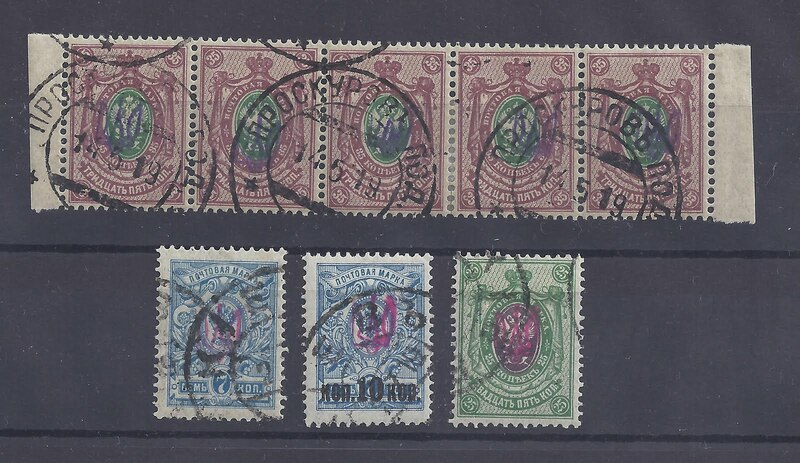 I have been looking at Kyiv I Broken Tridents from Lot 84 of the Zelonka sale (Bulat 62 - 108). 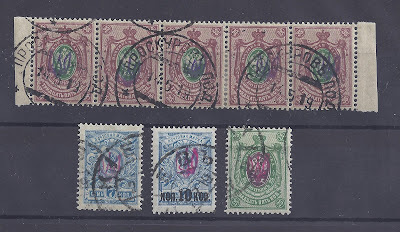 These are not very interesting, since they are almost entirely philatelic productions. 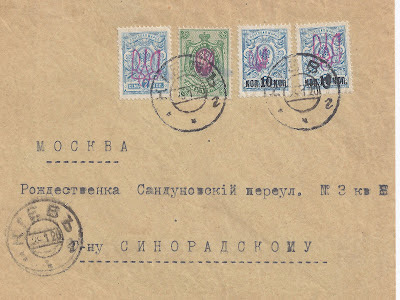 Most are cancelled to order at PROSKUROV in Podillia: see the strip of 5 above with cancellation dated 14 5 19. Anyway, in addition to the regular Broken Trident overprints in violet there are a few in red (a sort of pink - red). Bulat lists red overprints on the 10/7 kopeck, the 25 kopeck and the 50 kopeck imperforate (Bulat 71a, 75a, 90a). Dr Seichter also lists this overprint on the 7 kopeck, which I have - see the three stamps illustrated above. Both catalogs agree that these red overprints are rare, with Bulat using a price range of $75 - $150. I now have a total of 9 copies of these stamps (but I don't have a copy of the 50 kopeck imperforate)and all are cancelled KIEV and none are cancelled Proskurov. And the date is later and where readable in 2 7 19. So my little theory is this: though most of the Broken Trident overprints were exported to Podillia in mint conditon and cancelled to order there (in an area under UNR control), the handstamp remained in Kyiv. To mark the Bolshevik (Red) take-over of Kyiv, someone had the idea of making Broken Trident overprints in red. They clearly did not make very many. Dr Seichter listed and signed these overprints, though sometimes he marks them as "Neudruck" which of course they are in relation to the original printings both of Kyiv I and the Broken Trident variant. My suggestion is that they should be thought of as Bolshevik - flavoured Tridents. Here is a cover from a recent auction. 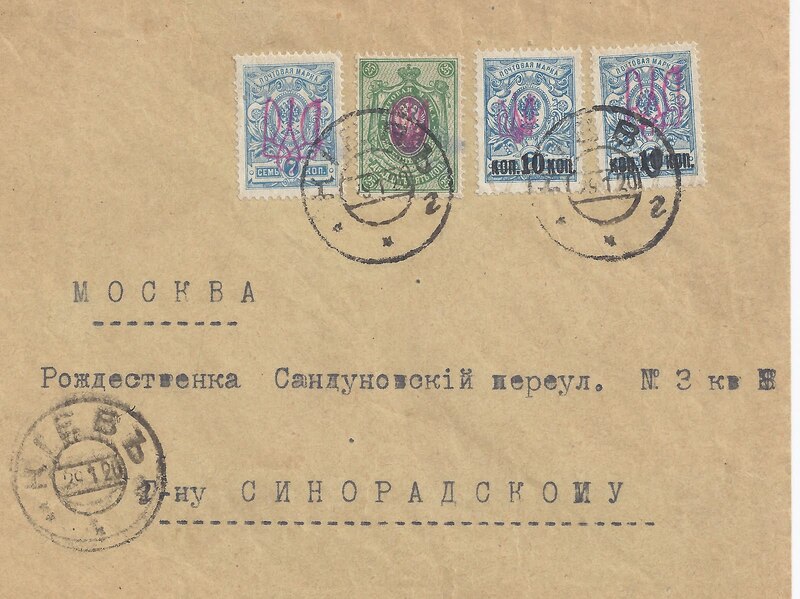 Dated even later (29 1 20)and addressed to Moscow (though I do not think it travelled), it has two red Broken tridents in the middle flanked by Kyiv IIgg in red on two other stamps, all clearly from the same ink pad. When I looked inside the envelope, I found Dr Seichter's signatures combined with his Opinions: the Kyiv I Broken Tridents he treats as Reprints (Neudruck) and the Kyiv IIgg overprints as philatelic productions (Philatelisten Druck). Interestingly, the KIEV canceller appears to be the same as the one used on my loose stamps.